Continuing their interview series from last week, Weekly Famitsu asked a group of game developers on their ideas and hopes for the future of gaming. 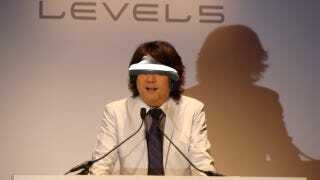 Among the gaming bigs this week was Level-5 honcho, Akihiro Hino, who expressed his wish to make a new open world game. Asked about what technology he was most interested in, Hino emphasized the need for a newer next-generation interface technology. "What I look for of the gaming world is the virtual experience, so I am looking forward to the evolution of interfaces." Hino explained. "Something like a head-mounted display or complex voice input. Things like that would increase the immersive level of the virtual experience." As for what kind of game he would like to make, ignoring management and financial constraints, Hino dreams of making a new open world game. "I've played hundreds of hours of Skyrim and Dragon's Dogma," said Hino, "and I'm constantly thinking, ‘If only they did this' or ‘I would have done this.' I think that when you feel that way, it's the best time to make a game." Level-5 is currently developing the open world game, Fantasy Life, but Hino explained that development is currently in the director's hands and not his own, and that he dreams of heading his own open world game. When asked about the possibility of an Akihiro Hino developed open world game, Hino said, "… It's quite possible." Hino himself has already gained a reputation for the development of quality game entertainment for all ages over the years. Now, as a game designer, Hino is looking to create a grand new world. "I expect to begin quite soon." He added. A Level-5 developed Skyrim-like game sounds… kinda awesome.